It’s affordable, it’s online and more convenience than ever. 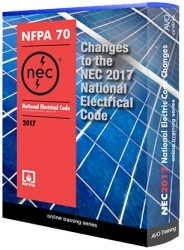 The 2017 NECC Online Training Course presents a condensed overview of the changes to the National Electric Code. This is a 2-hour video presentation, which includes review questions between video segments, and a Final Test. 1. Identify changes in the 2017 NEC (National Electric Code) that affect the Electrically Safe Work Conditions and Practices at the worksite. Supervisors & Managers of Technicians & Safety Professionals.